Adrien can’t get away from his wicked sister fast enough after his adoptive parents die in a horrific accident; it takes something huge to get him back in the same city as his sister, his past, the ghosts he’s been trying to outrun, and danger he doesn’t see coming. Brewer writes from Adrien’s point of view, allowing readers to feel deeply some very painful parts of his life, the arrogance that masks his self-doubt, his humor and intentions, and how bewildering it is to be labeled by people who have no real idea who he is. Adrien is well-off, white, good-looking, and in a lot of pain. Readers understand why others see him as they do, and they know that none of them are exactly right. The central premise is engaging—did Adrien’s sister lead their parents to their deaths, and is he next?—and though the book is an easy read, it’s not a simplistic one. Brewer isn’t afraid to show how smart Adrien is, using cinematic, almost Gothic phrasing, humor, suspense, compassion, and sensitivity to the nebulous natures of sexuality and identity. The characters are richly wrought but broad enough to not be pinned into one era, which means this book will seem fresh to new readers for decades to come. 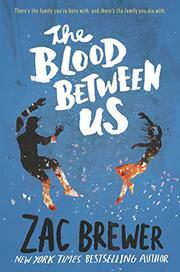 Brewer confides to readers in a prologue that he has transitioned from Heather to Zac and has come out as gay. Although overarching issues of identity are felt in this book, Adrien is not a trans character.